This Thanksgiving Day was not the greatest. We weren't planning to celebrate until the weekend, since we still had class on Thursday, but it still seemed like the day should be a little special, since it was actual Thanksgiving. I thought maybe I could at least do a little Thanksgiving craft with Juliana. I picked up a few things around the house and was emptying the trash in Juliana's room when I saw it. Nasty growing green stuff. My eyes traveled along the edge of Juliana's windowsill and everywhere I looked the mold was sprouting up again. The window in her room is already not the best part of the house – the ridiculously thin inner windows aren't enough to keep out the cold and the landlord is unwilling to fix the broken outer windows, so we constructed our own window replacements with old window screens, thick plastic, tape, some wooden supports, and yes, chopsticks. The room has been much warmer, but every day the windows cover with condensation...water which drips down into the old windowsill boards. We re-varnished the boards a few months ago, but they are so cracked and warped that the moisture keeps soaking through, The radiator is directly underneath the window, so we have our own mold breeding ground. And it was certainly breeding again. On Thanksgiving morning as I stood looking at the mold I felt frustrated and defeated. I was pretty sure that no matter what we did, the mold would just come back. Suddenly our apartment felt like a giant, toxic mold breeding factory. The bathroom has no ventilation and is covered with water every time we shower, so it molds. In the wintertime all the windows cover with condensation (or ice, when it's cold enough), and all the radiators are directly under the windowsills. Even the kitchen windowsill, which is tile and generally stays pretty cold, manages to produce mold. Our stupid little stove alcove is almost impossible to keep clean, so in the wintertime it forms frozen mold! I grabbed my vinegar (the strongest cleaning supply I have around right now) and scoured Juliana's windowsill and then moved on to attack the kitchen. As I cleaned I thought about what we could do. Move!! No, not really. We have no place to move to, and anyway have already paid rent through July. But this would mean we'd need to move Juliana out of her room. Juliana has been coughing for the last two months. I don't know if the mold is the cause, but I know it's not helping. When I took her to the doctor the other day he said he though she had an infection and gave her antibiotics. I hope it is an infection. I would like it to be that easy to clear up! But I know doctors like to give antibiotics for just about everything here, so I remain a bit skeptical. Besides, if you only have to pay 60 cents to see the doctor, doesn't that make you a little leery of their medical advice? As I spent my Thanksgiving morning cleaning up mold, I did not feel grateful. I felt frustrated and overwhelmed and angry. The kind of angry that spreads from one specific area to encompass every wrong recently experienced. I was angry with this old building that is a mold machine. I was angry with Chinese builders for not making better buildings that wouldn't turn into mold machines. I was angry at the landlord for not having higher standards. I was angry at the doctor for prescribing Juliana medicine that was banned in the US because of possible liver damage. It's probably the third or fourth time that's happened to us. I was angry at the whole Chinese medical system. I was angry with all the people who keep telling us that Juliana is coughing because she's not wearing enough clothes or not drinking enough warm water or that we would dream of giving her cold milk and yogurt. Doesn't anyone understand germs – and mold? I was angry at the roaches who have taken us up on the “our home is your home” mentality though I'm quite sure we never extended that invitation. Of course mold and roaches and poor construction and well-intentioned advice can happen in any country, but somehow this all seemed like CHINA'S FAULT. This is what we call a “bad China day,” and I hadn't had one of those in a long time. So here it was Thanksgiving and I was feeling less grateful than I had all year. I knew I should feel grateful, but that wasn't helping. Even in the midst of my terrible mood I could recognize that old familiar feeling: entitlement. 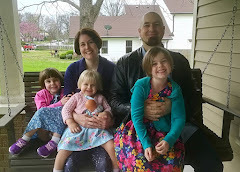 It's not enough to have a warm, mostly comfortable home nicer than most people in the world – one large enough that we had another room to move Juliana into – I want a better house. It's not enough to have medical care when many people have none – I want the standard I am used to. It's not enough to be surrounded by caring people who are concerned about Juliana – I want their concern to be scientifically accurate! All these expectations seem entirely reasonable because I am American. If I just lived in America I could have all these things (more or less), so even though I choose to live outside America I still feel like it is my due. I can't think of much that is less conducive to gratitude than a sense of entitlement. It’s pretty ugly, but I find it creeping in much more often than I would like. For some reason it’s so much easier to recognize the things you don’t have. This summer we heard several messages related to gratitude and generosity that have been on my mind ever since. Erwin McManus said, “It is a life of gratitude that makes us whole, overwhelms us with love and moves us to live generous lives." I really do think that gratitude and generosity are intimately linked. When we become so busy looking at the small lacks in our own lives, we lose sight of the genuine needs of others. Entitlement leads to bitterness and stinginess. Gratitude leads to joy and generosity. She called at 3:30 to ask if we were home and if she could come to see Juliana. The woman we affectionately refer to as the “Bike Lady” (because I met her last year while riding my bike back from a supermarket in the old city 40 minutes away) wanted to bring some instructions for making Chinese medicine for Juliana's cough. She used to just show up at our door without any notice (like a typical Chinese person), but after coming a few times while we were out, she's started calling to make sure we'll be home. I almost said that we were busy because I knew Ayi was about to arrive and take Juliana outside to play. But this was the only day of the week we didn't have tutor time. I was looking forward to a little bit of a break in a busy week, but it was really the best time for her to come. Within twenty minutes, the conversation turned to food. The Bike Lady was asking if Juliana likes to eat Chinese food. “Of course,” we said. “We all love Chinese food.” She made up her mind. “Do you like noodles?” she asked. “Yes.” “Then I will cook you some noodles. I make some good noodles.” Before we could say no, she began making a list of things for Ayi to go and buy at the vegetable market, running down the list of things we had in our kitchen and things that were missing. “They usually don't have many vegetables at home,” Ayi said. We were overwhelmed by her generosity. I couldn't help but be reminded of the ways we are called to care for one another. And I was challenged. How often do we go out of our way to help those around us, even just with a simple thing like washing the dishes for them or offering to make them a meal? Even more, how often do we in turn let someone else serve us? How easy it is for us to get so busy and schedule our time so tightly that we have no room for hospitality. How easy it is for us to feel inconvenienced when someone shows up at our door and miss out on both the chance to bless them and give them an opportunity to bless us. When Ayi returned, the Bike Lady started going through our cupboards, trying to find the right ingredients for the noodles she wanted to make. I pointed her to the salt, the vinegar and the soy sauce. “Do you have 酱?” she asked. Since 酱 generally means “sauce, I asked,”“What kind of 酱?” “ 酱”she replied. Clearly I was missing something. I told her I wasn't sure. She said it didn't matter. Then she shooed me out of the room and set to work on making the meal, making everything from scratch. With us, Ayi is generally not very talkative, but with the Bike Lady she opened right up, marveling at the way everybody adores Juliana and communication difficulties with us. She eagerly noted how she thought Juliana was “像洋娃娃 (“like a foreign doll”) - a phrase Chinese people often use to describe particularly cute babies. In think I found out more about Ayi in 10 minutes than I had in the last six months. The Bike Lady smiled as she placed huge bowls of noodles in front of us. We invited her to join us and she reluctantly agreed, constantly suggesting that Ruth hadn't eaten enough and marveling at Juliana's attempts to use chopsticks. When the clock struck 6:40, she blew right back out the door. She'd made plans to visit another friend who also lives on campus. A day that began with the strong jolt of an earthquake (4.7 on the Richter scale -- thankfully no damage) ended with a whirlwind. Perhaps inspired by the Bike Lady, yesterday, Ayi insisted that she make us jiaozi. I hesitated. I told her she didn't need to. It was too much trouble. But she insisted. “You don't eat enough Chinese food,” she said. So tonight, we'll celebrate American Thanksgiving in style with – what else? – Chinese dumplings Saturday with other foreigners in town, we'll eat 火鸡 – fire chicken – turkey). Tonight will be our little version of the first Thanksgiving, with the locals showing the outsiders what to eat. I am reminded that I need to cultivate a heart of gratitude. I need to be thankful for these blessings and so much more. 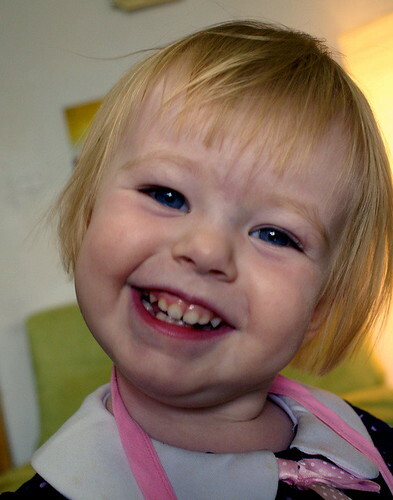 Smiley two-year-old, a photo by kevsunblush on Flickr. Last week China held their National Party Congress to elect a new leader. One of the results was a big crackdown on VPNs, what we use to access Facebook, blogs, or other websites not in favor in China. The Congress is over and we've been hoping for the VPN to start working again, but so far no such luck. In this week of silence, when we have been effectively shut off from the outside virtual world and had to resort to email to contact others. Kevin can still get to all his fantasy sports web pages, an activity which apparently poses no threat to China, but I'm more of a Facebook/blog girl myself. Something important could have happened in a friend's life and I'd never know since they'd just assume I saw it on Facebook. Of course probably all I'm missing is pictures of the food people ate and some inconsequential moments of their lives, but you never know. Somehow I have survived the internet withdrawal, sitting at the computer realizing there is nothing left to do except...study Chinese. Rough. In our non-virtual, unrecorded world (sometimes referred to as reality), Juliana has been busy absorbing the kindness/politeness messages she has been receiving. A few days ago I saw her standing over Dolly, who was lying on the floor. She fastened her serious gaze on Dolly and said, “Do you need help? Use your words. 'Help please. '” To my knowledge Dolly did not use her words, but Juliana picked her up anyway. The next day I heard her yelling, “Stop! Don't hit!” I walked in to see her slap her left hand with her right, then turn to her left hand and say, “No hitting!” She repeated the scenario with the opposite hand until they were both thoroughly chastised. Today Juliana was talking and laughing to herself in the mirror. She and mirror baby were having quite a nice time until she gave mirror baby a stern look and said, “No! Too loud!” I don't think it harmed their relationship too much though, because in another minute they were back to playing peek-a-boo. She may not quite have the actions down yet, but it's funny to hear her mimic the things I say. As we entered the church, the pastor was explaining that the bride and groom had selected a special day to get married. "Today is November 11," she said. "It is single's day." Typically Single's Day -- 11-11, is a day that the single people of the world (or at least China) celebrate their singleness. This couple decided to redefine it as their wedding anniversary - a day when two singles would be single no more. We hadn't planned on crashing their wedding. We were just trying to go to church. We didn't know that a wedding had been scheduled in place of the normal service. Still it was interesting. It's hard to blieve, but in this, our seventh year living in China, it was the first Chinese church wedding I've seen. Much like an American wedding, the couple exchanged their vows by responding that they "yuan yi" (agree) to promises to cherish, love, respect, honor and not leave one another for the rest of their lives. After completing their vows and exchanging rings, the bride and groom held their hands up to show off their rings for a moment. They also lit candles, which the pastor explained represented two families that were coming together to create a third family. And, though they hesitated a moment when the pastor told the groom he could kiss the bride, they -- somewhat embarssingly -- obliged. All-in-all, it was surprisingly westernized. The bride and groom wore Western wedding attire - albeit with a Chinese flair. The bride's gown, for instance, was draped with a thick layer of white fur near the neckline, perhaps because the temperatures outside were in the 40s. The man wore a suit with a red tie rather than a tux. There were also a few other differences from a typical American wedding. For one, nobody other than the couple getting married and the pastor appeared to be wearing special clothing. Secondly, there was a huge archway of pink balloons strung up across the aisle. And all the children in the congregation stood along both sides of the aisle, undoubtedly to wish the couple success in child-bearing -- a must in any Chinese wedding. Some alternated between standing still and dancing back and forth with impatience. Also notable was the timing. As I mentioned: it was held during the normal church service. And, as is typical in a Chinese church service, prayers were filled with "A-mens" changted in unison after each phrase and the whole congregation concluded the service by reciting the Apostle's Creed. The videographer couldn't help but notice the foreigners standing in the back while scanning the crowd and made sure to spend a considerable amount of time with his camera aimed directly at us. As the wedding came to an end, we made our way out of the building. At the door, gifts of watermelon seeds, peanuts and candies were shoved into our hands. They say a measure of your language progress is when you start to dream in Chinese, but I'm not sure if my dreams really count. Last night I dreamed about reflexive verb endings. Seriously. I recently had a dream in which I was sitting in class making up several sentences trying to use 把 (ba) and 拿 (na), two characters with roughly the same meaning but different usage which I often use incorrectly in my waking hours. In my dream I kept making sentences and my teacher kept saying, "错了！错了！It's wrong! It's wrong!" It's possible that I dream in Chinese more than I realize because when I wake up during the night I often have Chinese phrases and sentence structures running through my mind. Perhaps it is just my brain frantically trying to categorize the things I shove into it during the day. I would say my dreams are a pretty good mirror of my language progress right now. I can speak more Chinese than every before...so I also make more errors than every before. We are constantly learning new sentence patterns and grammar for me to misuse, and since I can talk about many more topics, every time I try to talk I think of 20 more words I don't know how to say. It's a little frustrating. A year ago I was just excited to be making progress. It was hard to believe how much more I could say compared with two months before. Starting from practically nothing can really make progress more obvious. Now as our time set aside for official language study creeps toward an end, I realize that at the end of these two years, there will still be approximately 358,037,464,956 words I don't know how to say. There will still be whole areas of language I can't use. Every day I think of another "I can't believe I don't know how to say that" word or three. Perhaps I need to look back a little more to remember I am indeed making improvements. When I started studying my conversations would die out after about 2 minutes, or even sooner if people weren't asking the standard questions. Now I can talk for a couple of hours with my tutor in Chinese and still have more to say - provided we are talking about interesting topics, of course. I don't understand everything she says, and I can't remember all the words I want to use, but we are still able to communicate pretty well. So I guess I'm making progress. Maybe soon I'll start dreaming correctly in Chinese!